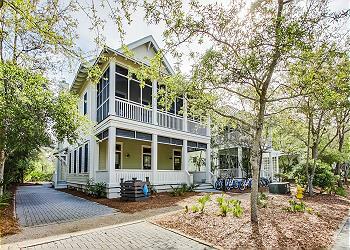 DETAILS: This five bedroom home is a perfect blend of traditional design and coastal flair. The massive living area and wide open kitchen is perfectly welcoming to you and your large group. With gourmet appliances and beautiful finishings, you'll feel at right home in this kitchen. The living room features a large flat screen over an impressive fireplace, bringing the whole family together each evening. On the first floor you will enjoy one queen bedroom with adjoining bath. The queen room offers access to a front porch and desk area. This floor also includes a Media room equipped with a sleeper sofa for two and it's own private bathroom. The two master suites are found on the second floor, both with sitting areas and screened porches and en suite bathrooms. The third floor includes a bedroom with two queen beds and a bunk nook to sleep four. Right outside you will find a lofted area that has two sets of bunkbeds and offers a single vanity and shower/tub combo. The 3rd floor bedroom with 2 Queen beds sleeps 4. We had a last minute trip to Watercolor and it was great. Our family of 4 stayed at the house. 360 was very accommodating and the made the rental process super easy. The house was in a great location and very nice. We own several houses and if I was providing any feedback to help the owner, I would say that the house needs more kitchen friendly items, such as serving platters and blenders for entertaining. Also, some fun artwork would make the house seem warmer. When we arrived there was a funny smell so we bought a candle and that helped. Overall, we enjoyed our stay and will definitely be back in Watercolor! We loved this house. When we arrived the oven was very dirty and freezer needed to be cleaned. Also, master bathroom tub was not very clean. It did appear to be in the process of being decorated. Otherwise, this is a very nice home. We are very glad that you enjoyed this home for your vacation in Watercolor! We apologize for the lack of cleanliness in the home upon your arrival. In the future, we would be more than happy to send a cleaner back out to the home to address the areas that need to be cleaned. We will be sure to share this feedback with our entire team and we hope we are able to host you all again soon! The house was perfect! A short bike ride away from the grocery store, pools, the lake, the beach, and Seaside Town Center. Watercolor and 360 Blue staff were very friendly and helpful when needed. The house had the perfect well-equipped kitchen so we really never had to leave. Plenty of space for everyone, just perfect. Many thanks to the owner for putting together such a great package! Staying at this house in Watercolor was an absolute dream. The house was beautiful and comfortable and had so much room! We had three families in the house and were completely comfortable. The location was perfect for accessing the beach, shops, and boat house. The house had a beautiful view of the lake. We hope we can come back soon. It was perfect for our family vacation. We are so glad that you enjoyed your vacation with us in Watercolor! 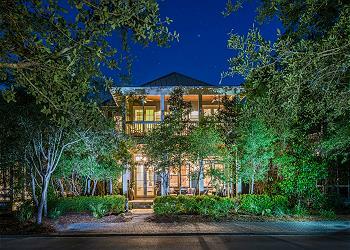 We agree that this home is absolutely sublime and the location is hard to beat! We look forward to seeing you and your family again very soon!